An early tea will be taken at Trent Bridge, where Notts have reached 289 for five, a lead of 376. Only four overs of play were possible at the start of the afternoon, before rain intervened, but they enabled Brendan Taylor to write his name into the Nottinghamshire record books. The former Zimbabwe captain registered his second century of the match, getting there from 80 balls, with nine fours and five sixes. 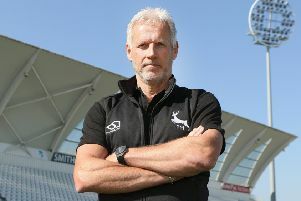 Russell Warren, against Middlesex in 2003, was the last Nottinghamshire batsman to achieve the feat. Scott Borthwick picked up his eighth wicket of the match in the brief session, having Samit Patel caught behind for 10.